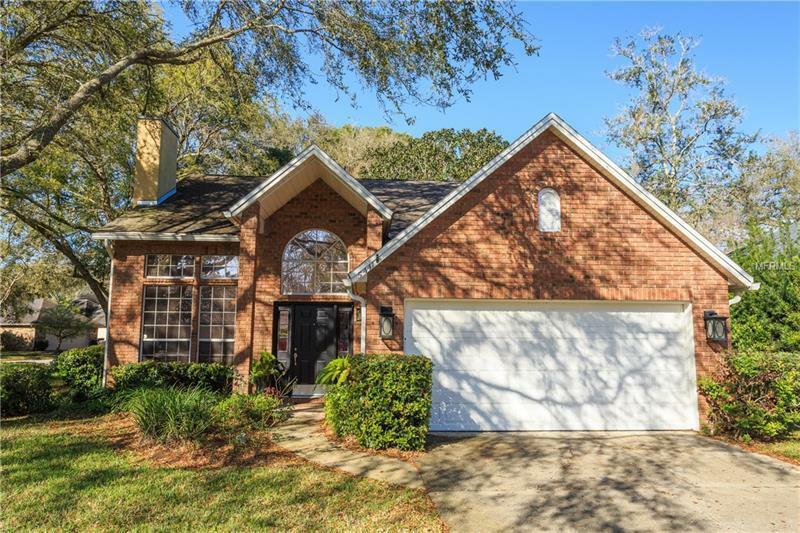 This beautiful brick home sits on an oversized corner lot in desirable Lakes of Aloma. It features an eat-in kitchen with a center island and plenty of cabinets and counter space. There is a separate dining room, wood and ceramic flooring throughout the home, a wood burning fireplace, vaulted ceilings, crown molding, and a large screened in patio. The spacious downstairs master suite has beautiful french doors that open to the back courtyard. Other newly added features of this home include a roof (2014), Trane AC (2013), windows and french doors (2018), water tank (2018), irrigation system (2017), custom built library in the loft area, and a dishwasher (2018). Community offers Park area with Gazebo and hosts neighborhood get-togethers, a boardwalk through conservation and dock overlooking Deep Lake , fishing permitted.